NEW! 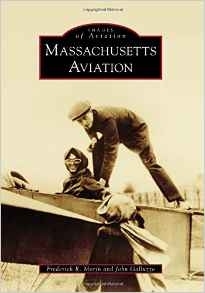 Patriot Squadron member John Galluzzo co-wrote this new photo-book about the aviation history of Massachusetts for Arcadia Press' popular "Images of America" series. Although the book provides a general survey of aviation in Massachusetts, NAS Squantum and NAS South Weymouth are prominently featured. 128 pages. Filled with hundreds of photographs. You can obtain this book on-line here. NEW! Second World War military service memoirs of Navy blimp pilot Donald Venton, who served with ZP-11 at NAS South Weymouth during 1944 and 1945. 207 page softcover. Chapters cover Don's flight training and wartime assignments to Texas, Brazil, and South Weymouth. Among other things, the author was on board the K type blimp K-34 when it crashed into the Atlantic Ocean off the coast of Massachusetts with the loss of two crewmen. Of interest to anybody who is interested in a first-person description of what went on at NAS South Weymouth during the Second World War. Not available in stores. To order on line go here or send a check for $25 to Naval Airship Association, PO Box 700, Edgewater FL 32132. Local veteran David Banagis recently wrote and published his Navy memoirs, "Twenty-Three Days at Sea". Dave was a Navy yeoman (YN) who served at NAS South Weymouth from the late 1950s through the 1980s. He started as a YNSN with the Naval Air Development Unit (NADU - see book immediately below) and then ended his career as a YNC with the base commanding officer's staff. David's book is not available in stores and can only be obtained on-line by clicking here. Check it out! This book, "NADU: The Forgotten Naval Air Development Unit of NAS South Weymouth", presents the story of the Naval Air Development Unit (NADU) that operated at Naval Air Station South Weymouth between 1953 and 1961. NADU was a little-known regular Navy command that provided flight testing support for secret military R&D projects associated with the MIT Lincoln Laboratory, Office of Naval Research, Naval Research Laboratory, Air Force Cambridge Research Center, MITRE Corporation, and similar organizations. Perhaps the most important project that NADU was involved with was the pioneering computerized Semi-Automatic Ground Environment or "SAGE" air defense system. Though largely forgotten today, NADU had one of the most diverse fleets of aircraft in the Navy. NADU operated jet fighters, radar picket aircraft, ASW aircraft, transports, and blimps. This 571 page book is a comprehensive illustrated history of NADU, telling its complete story for the first time ever using detailed narrative, 405 illustrations, and personal remembrances from NADU veterans. All proceeds from the sale of this book go to the Association of Naval Aviation Patriot Squadron. The book is not available in stores and can only be obtained on-line by clicking here for softcover ($36 plus shipping) or by clicking here for hardcover ($50 plus shipping). This is a reprint of "Squantum Weekend Warriors", a book that was produced by NAS Squantum, Massachusetts during 1952 in conjunction with the base's annual open house and air show. This profusely illustrated 71-page book presents the history of NAS Squantum, the very first Naval Air Reserve Training Base, with text and hundreds of photos. It is an exact duplicate of an extremely rare half century old original - complete with the originals minor printing flaws - and is a terrific piece of history. All proceeds from the sale of this book go to the Association of Naval Aviation Patriot Squadron. This book is not available in stores and can only be obtained over the Internet directly from the printer for $20 plus shipping by clicking here. This is a reprint of "The Defender's History", a book produced by NAS South Weymouth, Massachusetts in 1996 to commemorate the closing of the base. This profusely illustrated 90-page book presents the history of NAS South Weymouth and its predecessor, NAS Squantum, with text and hundreds of photos. All proceeds from the sale of this book go to the Association of Naval Aviation Patriot Squadron. This book is not available in stores and can only be obtained over the Internet directly from the printer for $20 plus shipping by clicking here. This is the story of ANA Patriot Squadron member Bill Horsch's 20-year career in Naval Aviation. Starting as a Seaman Recruit in WW2, Bill climbed the Navy's enlisted ranks to retire as a Senior Chief Aviation Electronics Technician at the height of the Cold War. Originally an aircraft radio and radar systems maintainer, Bill later became an aircrewman flying many different aircraft such as the SB2C Helldiver, PBY Catalina, P4Y Privateer, R4D Skytrain, and S2F Tracker. During the early postwar era Bill was part of the elite cadre of active-duty "stationkeepers" who moved New Englands Naval Air Reserve headquarters from historic NAS Squantum, MA to NAS South Weymouth. This book features 151 pages and 33 photos covering Bill's experiences in WW2 as well as his postwar career in the Naval Air Reserve Training Command at NAS Squantum and NAS South Weymouth, MA, NAS Los Alamitos, CA, and NAS Minneapolis, MN. This book is not available in stores and can only be obtained over the Internet directly from the printer for $15 plus shipping by clicking here. This is the story of VP-92, a Navy Reserve patrol squadron that flew Lockheed P-2 Neptunes and P-3 Orions on maritime patrol, anti-submarine warfare, and counter-narcotics missions as well as for search-and-rescue and other purposes. VP-92 was originally based at NAS South Weymouth, MA between 1970 and 1996. In 1996, due to the impending closure of NAS South Weymouth, the squadron was relocated to NAS Brunswick, ME. VP-92 operated from NAS Brunswick until it was disestablished in November 2007. The book also presents the history of NAS South Weymouth and NAS Brunswick, discusses VP-92's WW2 namesake VP-92/VPB-92, and its predecessor reserve patrol squadrons at NAS Squantum and South Weymouth (VP-919, VP-ML-69, VP-911, VP-912, VP-913, VP-914, VP-915, VP-916, and VP-917), and also discusses the circumstances that led to the creation of VP-92 in 1970. This expanded second edition has 303 pages and 451 illustrations. It is not available in stores and can only be obtained on-line by clicking here for softcover ($28 plus shipping) or by clicking here for hardcover ($44 plus shipping). In August 1970 two Navy Reserve patrol squadrons based at NAS South Weymouth, VP63Z2 and VP11Z4 were sent off together on two-weeks annual training to Naval Station Rota, Spain. This was the last annual training cruise by reserve patrol squadrons based at NAS South Weymouth before the reorganization of the Naval Air Reserve in late 1970 and the formation of VP-92. After the two squadrons returned to NAS South Weymouth, Air Wing Staff Z1 put together a 19-page saddle-stitched softcover "cruise book" for the reservists as a souvenir of their adventures in Spain. This is an exact reprint of that rare Navy cruisebook, which has been duplicated as a fund-raiser for the VP Association, a Navy Reserve veteran's group. It is filled with photos of squadron personnel, their Lockheed SP-2H Neptune aircraft, and shows many of the things that they did both on and off duty while in Spain. This book is not available in stores and can only be obtained over the Internet directly from the printer for $12 plus shipping by clicking here. In July 1967 three Navy Reserve patrol squadrons based at NAS South Weymouth, VP-911, VP-912, and VP-913, were sent together on two-weeks annual training to Naval Station Roosevelt Roads, Puerto Rico. This was called "The Hardware Cruise". For the purpose of this joint training exercise the three reserve squadrons were temporarily designated VP-910. After the three squadrons returned to NAS South Weymouth, Reserve Air Wing 91 put together a 19-page saddle-stitched softcover "cruise book" for the participants of this training exercise as a souvenir of their adventures in Puerto Rico. This is an exact reprint of that rare Navy cruisebook, which has been duplicated as a fund-raiser for the VP Association, a Navy Reserve veteran's group. It is filled with photos of squadron personnel, their Lockheed SP-2E Neptune aircraft, and shows many of the things that they did both on and off duty while on this exercise. This book is not available in stores and can only be obtained over the Internet directly from the printer for $12 plus shipping by clicking here. This 115 page book is a collection of "sea stories" recounting the experiences and adventures of Naval Air Reservists who flew and maintained PBY Catalinas, P4Y Privateers, P2 Neptunes, and P3 Orions with the various reserve patrol or "VP" squadrons that were based at NAS South Weymouth between 1953 and 1997. There are a few stories included about the carrier anti-submarine or "VS" squadrons that were assigned to South Weymouth as well since many of the personnel assigned to the base's VS units were transferred to the VP squadrons when the VS units were disestablished. This book as created as a fund-raiser for the VP Association, a Navy Reserve veteran's group. It will be of great interest to anybody who served in the Naval Air Reserve or who is interested in Naval Aviation. This book is not available in stores and can only be obtained over the Internet directly from the printer for $15 plus shipping by clicking here. This is a second volume of "sea stories" similar in concept and format to Volume One presented above. 115 pages of oral history as recounted by veterans of the Naval Air Reserve patrol squadrons based at NAS South Weymouth and with a few stories about NAS Squantum thrown in as well. This book as created as a fund-raiser for the VP Association, a Navy Reserve veteran's group. It will be of great interest to anybody who served in the Naval Air Reserve or who is interested in Naval Aviation. This book is not available in stores and can only be obtained over the Internet directly from the printer for $15 plus shipping by clicking here. Mel Shettle's Naval Air Stations of World War Two, Volume One, covers the eastern part of the United States and includes coverage of NAS Squantum and NAS South Weymouth. Order on-line by clicking here. This terrific book by the late legendary airship historian James Shock presents a history of American airship bases and includes a lot of information about NAS South Weymouth. The book includes more than 100 illustrations showing blimp bases, hangars (including NAS South Weymouth's original LTA hangars #1 and #2), mooring masts, etc. Order on-line by clicking here. In 1958 the Naval Air Development Unit (see John Yaney's book at the top of this page) sent a ZPG-2 type blimp from NAS South Weymouth to the Arctic Circle and back to demonstrate (allegedly) that Navy blimps could operate in the polar regions. Coincidentally (or not) the ZPG-2 "Snow Goose" went on its "Arctic Mission" at the same time the nuclear submarine USS Nautilus went in it voyage under the polar ice cap. A terrific book with over 100 photographs, many of which were taken at NAS South Weymouth. Order on-line by clicking here. During WW2 NAS South Weymouth was established as a blimp base and even in the postwar era the Naval Air Development Unit (see John Yaney's book at the top of this page) operated a variety of blimps from the base between 1954 and 1961. This profusely illustrated book presents all the various types of blimps that were operated at NAS South Weymouth. Order on-line by clicking here. Forgotten Weapon by William Althoff presents the story of how the Navy used blimps to combat submarines during the Second World War. There is some coverage in this book about NAS South Weymouth's wartime airship patrol squadron, ZP-11. Order on-line by clicking here. This book, which was compiled from VADM Charles Rosendahl's memoirs, presents the story of the Navy's blimps during the Second World War. There are are some references in this book to NAS South Weymouth's wartime airship patrol squadron ZP-11. Order on-line by clicking here. Wings over Cape Cod presents the history of NAS Chatham, which was an ASW blimp and seaplane base during World War One. Though largely forgotten today (it did not last very long), NAS Chatham was in many ways the direct predecessor of NAS South Weymouth. Order on-line by clicking here. The ANA Patriot Squadron has refrigerator magnets available with NAS Squantum, NAS South Weymouth (two styles - round and triangular), and ANA Patriot Squadron insignia designs (above). Each magnet costs $5.00 with shipping included. All proceeds from the sale of these magnets goes to the Association of Naval Aviation Patriot Squadron. To order send a check covering the cost of the desired magnet(s) to ANA Patriot Squadron, Attn: Magnet Offer, Shea Naval Aviation Museum, 495 Shea Memorial Drive, South Weymouth MA 02190. Be sure to send a note indicating which magnet(s) you want! 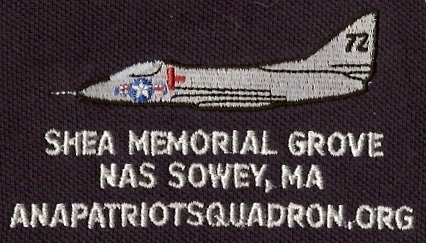 The ANA Patriot Squadron has a limited number of authentic embroidered patches available for commands that were based at NAS Squantum and/or NAS South Weymouth (above). You can buy these patches at the Shea Naval Aviation Museum for $6 each or order through the mail for $7 each with U.S. shipping included. All proceeds from patch sales goes to the ANA Patriot Squadron. To order send us an e-mail message indicating which patch(es) you want and we will tell you where to send the check if what you want happens to be in stock at that time (patch quantities are limited and may not be reordered if a specific design runs out). The ANA Patriot Squadron is selling vinyl decals, as shown here at left, which are reproductions of originals that used to be sold at the Navy Exchange at NAS South Weymouth during the 1976-1996 period. The weatherproof decals are meant to be stuck on to the exterior surface of automobile or home window glass but can be attached to any smooth surface. These are $3 each if you buy them at the museum or you can order through the mail for $4 each with U.S. shipping included. All proceeds from patch sales goes to the ANA Patriot Squadron. To order send us an e-mail message. NEW! NAS South Weymouth challenge coins. This image shows the front and back of this item. Metallic gold colored 1.75 inch diameter coin with full color NAS South Weymouth base insignia and black enameled text. These cost $10 each if you buy them at the museum or you can order through the mail for $14 each with U.S. shipping included (they are fairly heavy). All proceeds go to the ANA Patriot Squadron. To order send us an e-mail message. NEW! NAS South Weymouth "remove before flight" keychains. This image shows the front and back of these nice keychains, which you can use for a variety of other purposes such as zipper pulls, etc. These cost $5 each if you buy them at the museum or you can order through the mail for $6 each with U.S. shipping included. All proceeds go to the ANA Patriot Squadron. To order send us an e-mail message. Authentic navy blue NAS South Weymouth command ball caps are now in. These are one size fits all and cost $20 each if you buy them at the museum or you can order through the mail for $25.60 each with U.S. shipping included. All proceeds go to the ANA Patriot Squadron. To order send us an e-mail message. 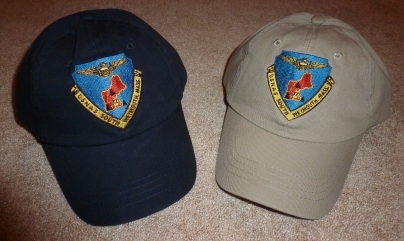 The museum also has ball caps, in navy blue and khaki, featuring the older style NAS South Weymouth base insignia used between 1958 and 1977. These are one size fits all and cost $20 each if you buy them at the museum or you can order through the mail for $25.60 each with U.S. shipping included. All proceeds go to the ANA Patriot Squadron. To order send us an e-mail message. Back in stock again for our Marine friends - red ball caps with a black, gold, and silver USMC globe and anchor insignia along with gold "Marine Air Reserve" and "South Weymouth, MA" text. Let everybody who sees you know that you served with the Marines at old NAS South Weymouth. These caps are one size fits all and cost $20 each if you buy them at the museum or you can order through the mail for $25.60 each with U.S. shipping included. All proceeds go to the ANA Patriot Squadron. To order send us an e-mail message. The museum has a very limited number of golf visors left in stock featuring the embroidered design shown here. They are adjustable so one size fits all and cost $20 each if you buy them at the museum or you can order through the mail for $25.60 each with U.S. shipping included. All proceeds go to the ANA Patriot Squadron. To order send us an e-mail message. VP-18 alumnus Bob Neu has color patches available as shown here featuring the P2V Neptune. The 12 long version costs $28 plus $2 shipping while the 4 long version costs $6.50 plus $1.50 shipping. To order send a check to Bob Neu at 1165 Kinne Circle, Batavia IL 60510-4556. You can e-mail him at bneu57@gmail.com. NEW! The Association of Naval Aviation (the national group) has made arrangements with on-demand shirt marketer CINTAS to produce Polo shirts with the ANA logo. You can buy these shirts on-line here.